as Taschen Books beautifully introduced the man. 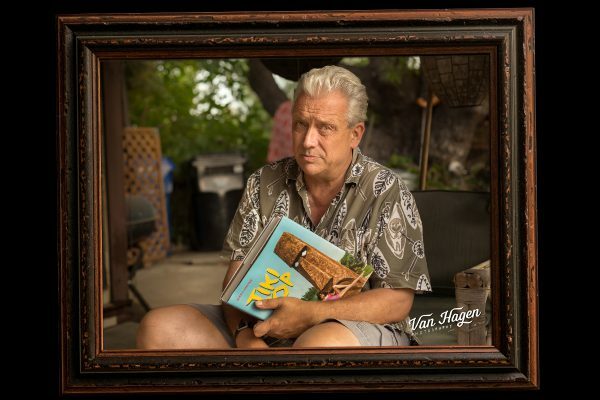 Cinematographer Sven Kirsten is the author of the “Book of Tiki”, widely acknowledged as the bible and several other publications deepening the research on his favourite subject of polynesian pop culture. 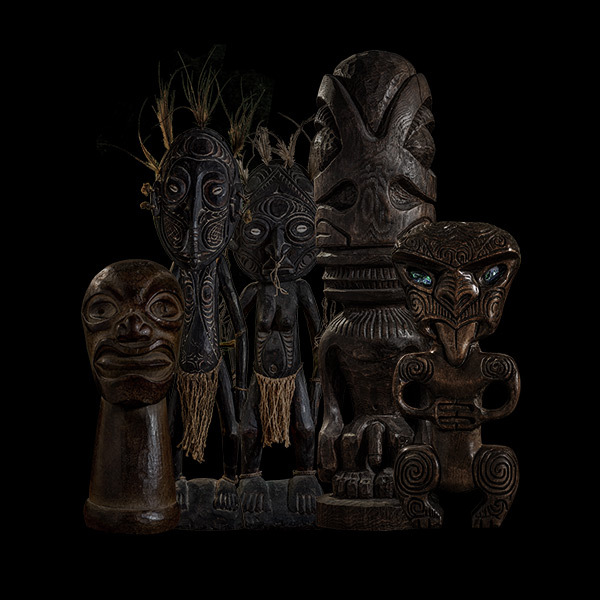 “Tiki Modern“ explores Tiki style’s relation to mid-century modernism and “Tiki Pop“ is the complete chronicles of the America’s obsession with Polynesia.His most recent book, „The Art of Tiki“, is a passionate study of the Tiki idol as an art form. For the first time, contemporary Tiki art is united and presented equally with what inspired it, original mid-century Polynesian pop. Such are the words of a true Tiki lover. Little did Karl know that 50 years later his love would be shared by a whole generation of Americans who worshipped the Tiki as their god of recreation. While bamboo bars and tropical watering holes had been popular in American cities from the 1930s on, it was not until the mid-50s that the Polynesian idol commonly called the Tiki became the ambassador of South Sea escapism. The post-war public’s taste had evolved into a fascination with exotic cultures, and as Hawaii was about to become a member of the United States, its art and sculpture was utilized to decorate Polynesian-style bars and restaurants. In doing so, American proprietors and their designers used their own imagination to embellish the traditional tribal models, and a new pop culture was born. The whimsical Tiki image proliferated in the form of statues, motel signs, menu covers and cocktail mugs. The contrast of primitive-looking Tiki carvings with mid-century modernism provided a unique esthetic friction unlike any design style before it. After Tiki fell out of fashion in the 1980s, urban archeologists unearthed its remnants piece by piece, gradually resurrecting the forgotten culture. Invigorated by the craft cocktail revival, a new generation of Tiki lovers is now partaking in its primal spirit in new Tiki hideaways all over the world. While Tiki style is based on a fantasy, it is not a free-for-all of exotic influences. Modern Tiki has a lot of leeway to play with pop culture ideas, but an authentic Tiki environment should always be recognizable as such. This means first of all that the figure of the Tiki, in carved and in rendered form, should be present. A bar does not became a Tiki bar just because it serves Tiki cocktails. The Tiki lover knows his Tiki STYLES. Modern artists were not concerned with the mythology but with the ART of Oceanic sculpture, inspired by the creativity of how the original island sculptors rendered the human form in a myriad of ways. 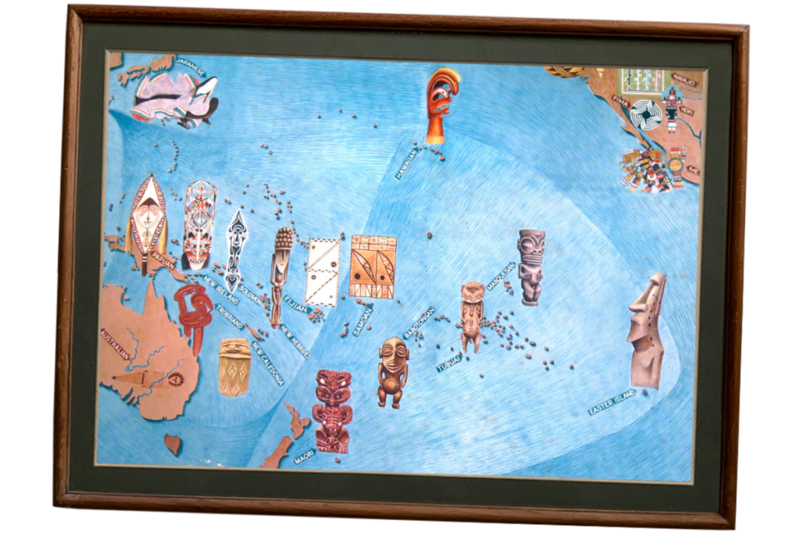 The different islands of the Polynesian triangle brought forth different forms of Tikis (see Covarrubias map below). Ultimately, the goal of the Tiki lover is to create the romantic atmosphere of exotic ports of call on remote tropical islands. These bars were decorated with souvenirs and mementos that sailors brought back from their travels in the South Seas, from mythical lands of strange rituals and beautiful wahines. For this, nautical props like ships models, puffer fish and beachcomber lamps are a helpful addition. Maps and travel posters, weapons, shrunken heads and images of island maidens flesh out the mood. Even the occasional Asian or African souvenir is not out of place – as long as the predominant theme is that of the South Sea island paradise. This is where Tiki and the Tiki lover feel at home. 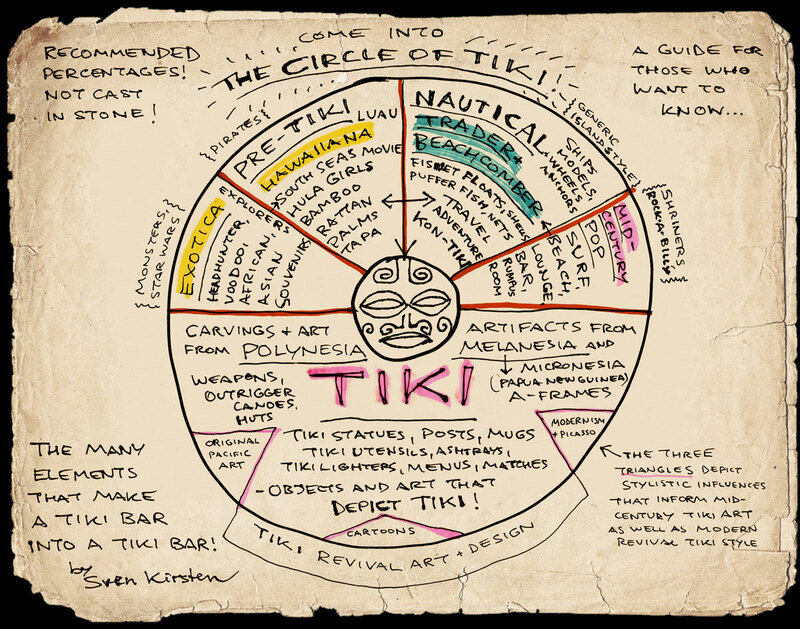 A guide for those who want to know which elements make a bar into a Tiki bar.